The majority of sales will of course be generated by an as of yet unconfirmed engine range, which could include the 1750 TBi turbo petrol of the Giulietta Quadrifoglio Verde and 4C and the 2.2 turbo diesel engine which develops 185-200 hp in the Jeep Cherokee. 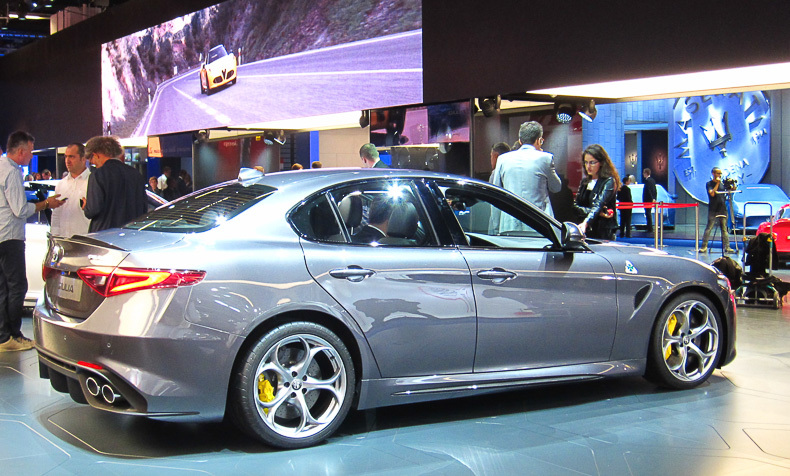 Torque Vectoring should improve power transmission to the road in low grip situations, an Integrated Brake System improves the brake performance, the Active Aero Splitter actively manages downforce, while the Giulia is also fitted with Alfa’s renewed DNA Pro, which modifies the dynamic driving behaviour, depending on if the driver has selected Dynamic, Natural, Advanced Efficiency or Race on the Quadrifoglio. Moreover, it comes with Chassis Domain Control for adaptive suspension. It is good to know that it offers enough space in the backseat too thanks to the claimed longest wheelbase in its category. 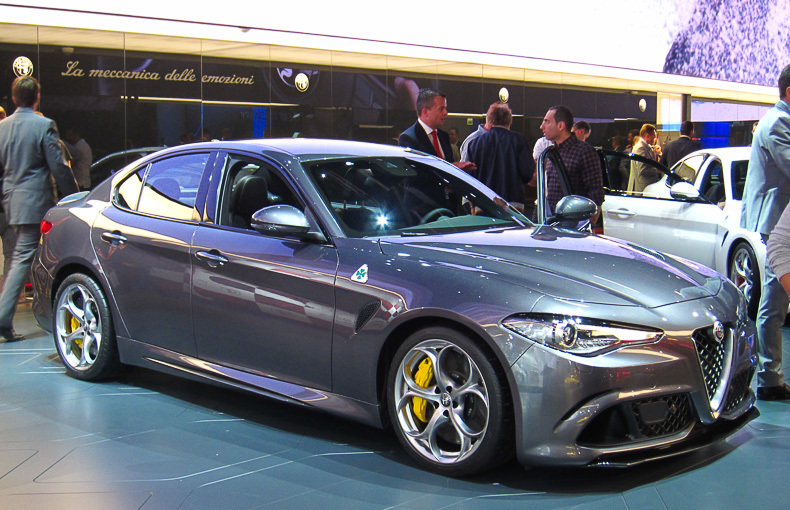 Whether a Giulia SportWagon will be launched or not depends on the sales success of the sedan. Although it is brand new, Audi has clearly taken the evolutional path when designing the fourth generation of its A4 sedan and A4 Avant. When it comes to aerodynamics, the A4 outpaces its competitors with a drag coefficient value of 0.23 and 0.26 of the A4 Avant, thanks to fine-tuning, including the underbody of the car, the lines of the luggage compartment and exterior mirrors on the doorsills. Its headlamps feature Xenon plus units as standard, and Audi also optionally offers LED headlights as well as matrix LED headlights. 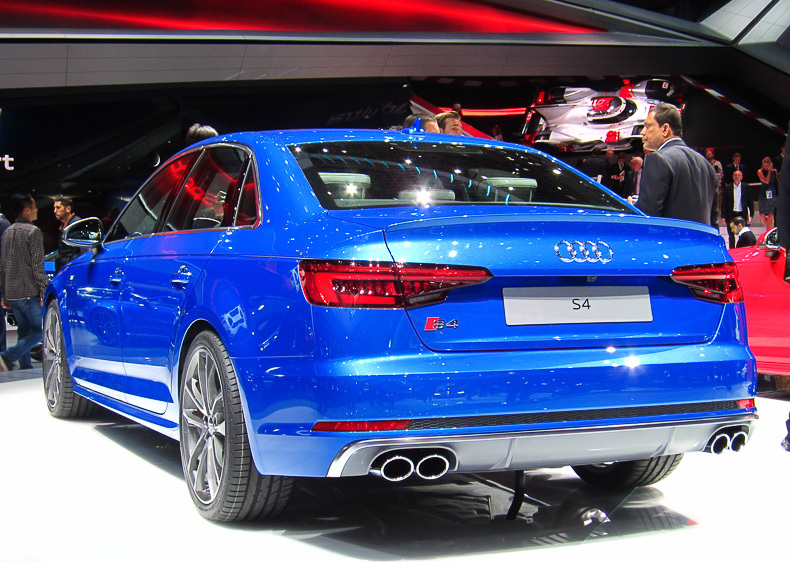 Length of the new Audi A4 sedan is 4,726 mm, which is 25 mm longer than its predecessor. The A4 Avant is 4,725 mm long. Its width has grown by 16 mm to 1,842 mm and its height unchanged at 1,427 mm (Avant: 1,434 mm), while its wheelbase has grown by 12 mm to 2,820 mm. 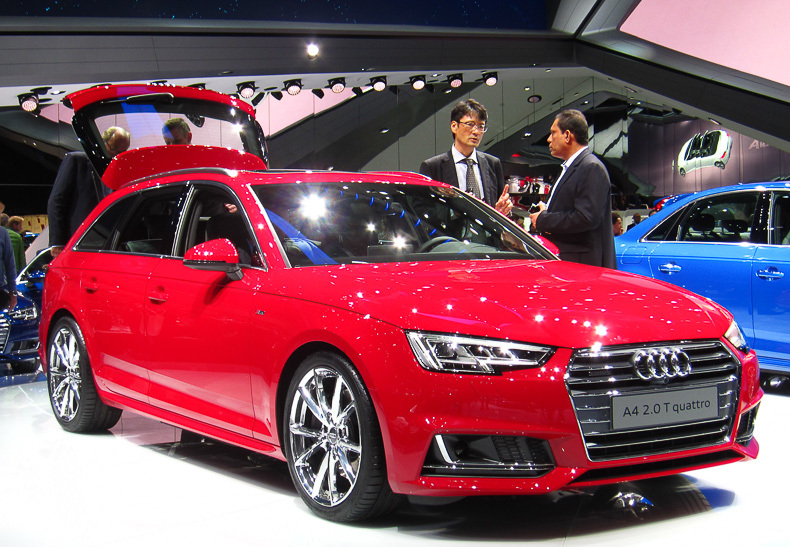 The A4 sedan has 480 litres of luggage capacity in the trunk, while the A4 Avant provides 505-1,510 litres. 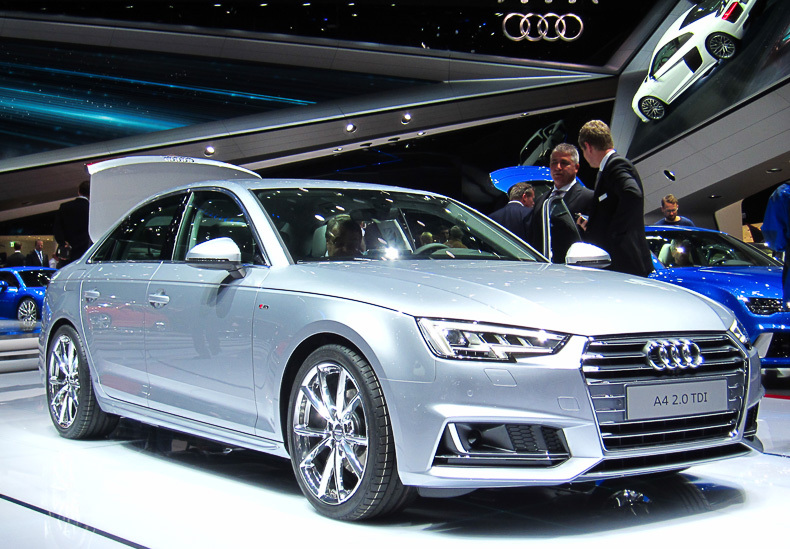 Audi managed to cut the weight of the A4 by up to 120 kilograms, depending on the engine. Audi announced four petrol and four diesel power trains, as well as a CNG version. The latter one, which only comes in Avant bodywork only, is powered by a 2.0 TFSI engine and a power output of 170 hp. The A4 Avant g-tron will become available in late 2016, while Audi will start selling the following engines immediately from its launch this autumn: the 1.4 TFSI (150 hp) with average fuel consumption and corresponding CO2-emissions of 4.9 l/100 km and 114 g/km respectively, which is followed by the 2.0 TFSI ultra (190 hp) with highly impressive numbers of 4.8 l/100 km and 109 g/km respectively. The regular 2.0 TFSI (252 hp) uses 5.7 l/100 km and emits 129 g/km of CO2. The diesel range starts with the 2.0 TDI ultra, with an average fuel consumption of 3.7 l/100 km and CO2-emissions of 95 g/km, while the numbers for the more powerful 2.0 TDI (190 hp) are 4.1 l/100 km and 107 g/km of CO2. The six-cylinder 3.0 TDI delivers 218 hp and uses 4.2 l/100 km of fuel and emits 109 g/km of CO2, while the most powerful diesel is the 3.0 TDI with a 272 hp power output, fuel consumption of 4.9 l/100 km and CO2-emissions of 129 g/km. The current range-topper is the new Audi S4, which is powered by a newly developed 3.0 TFSI turbo V6 engine mated to an eight-speed tiptronic transmission. The engine produces no less than 354 hp of power, and should still be able to be fairly economical with a fuel consumption of 7.4 l/100 km and CO2-emissions of 170 g/km. Power is transmitted to the road by quattro all-wheel drive. Audi’s virtual cockpit and head-up display are optionally available, as well as infotainment features like MMI Navigation Plus and Bang & Olufsen sound system with tablet as rear-seat entertainment. Safety features include Stop&Go adaptive cruise control, active lane assist and side assist, parking assist, rear cross-traffic assist, exit warning, turn assist, collision avoidance assist and camera-based traffic-sign recognition. BMW is readying a whole range of plug-in hybrid models, which now include the i3 REX, i8, 225xe, 330e, 740e and X5 xDrive40e. The BMW 2 Series Active Tourer joins the Ford C-MAX Energi in being the sole plug-in hybrid offerings in its class. However, unlike the Ford C-MAX the BMW 225xe has a lithium-ion battery, which have been arranged in a space-saving position under the rear seat bench, so that the upper area of the boot capacity can be used without restriction. The 225xe is powered by a 1.5-litre three-cylinder twinturbo petrol engine, which is brought together with an electric motor. The electric motor, capable of a power output of 88 hp, drives the rear wheels and allows an electric range of up to 41 kilometres, with a top speed of 125 km/h on electric power alone. The 1.5-litre engine produces 136 hp and sends its power to the front wheels via a six-speed Steptronic transmission. The system power of both engines is 224 hp and its peak torque 385 Nm. In hybrid mode the 225xe offers electrified all-wheel drive. Its fuel consumption is just 2.0 l/100 km and corresponding CO2-emissions 46 g/km. The battery can be charged through the recuperation of braking energy and generation of power while the car is on the move, but also from a domestic power socket, an optional Wallbox with high-voltage power supply, and public charging stations. With the latest Mercedes-Benz C-Class being a better all-rounder than ever and the new Audi A4 debuting at the same auto show, while the rear-wheel drive Jaguar (XE) and Alfa Romeo (Giulia) are obviously aiming at customers looking for a driver-focused car, an update of the BMW 3 Series is right in time. BMW made some subtle tweaks to the look of the model, featuring new bumpers with revised air intakes, revised headlights and taillights. Its interior offers better materials and a newly crafted centre console. The all-new 330e plug-in hybrid effectively replaces the ActiveHybrid 3. BMW has paired a 184 hp 2.0-litre petrol engine with an electric motor producing 88 hp, which resulted in a system output of 252 hp and combined torque of 420 Nm. Its fuel consumption is 1.9 l/100 km and the corresponding CO2-emissions 44 g/km. In an urban environment, the 330e should be able to cover up a range of up to 40 kilometres on electric power. The wide 3 Series range further consists of the 318i (136 hp), 320i (184 hp), 330i (252 hp), 340i (326 hp), 316d (116 hp), 318d (150 hp), 320d (190 hp), 320d EfficientDynamics Edition (163 hp), 325d (218 hp), 330d (258 hp) and 335d (313 hp), with the M3 naturally as the range topper. Apart from the 330e, the 3 Series comes with three all-new drivetrains: the 318i is powered by the 1.5-litre three-cylinder petrol engine with CO2-emissions starting at 119 g/km, the 330i by a 2.0-litre four-cylinder and the 340i by a 3.0-litre six-cylinder. BMW unveiled two all-new models in Frankfurt: the second generation of its X1 crossover and the sixth generation of its top end model 7 Series. 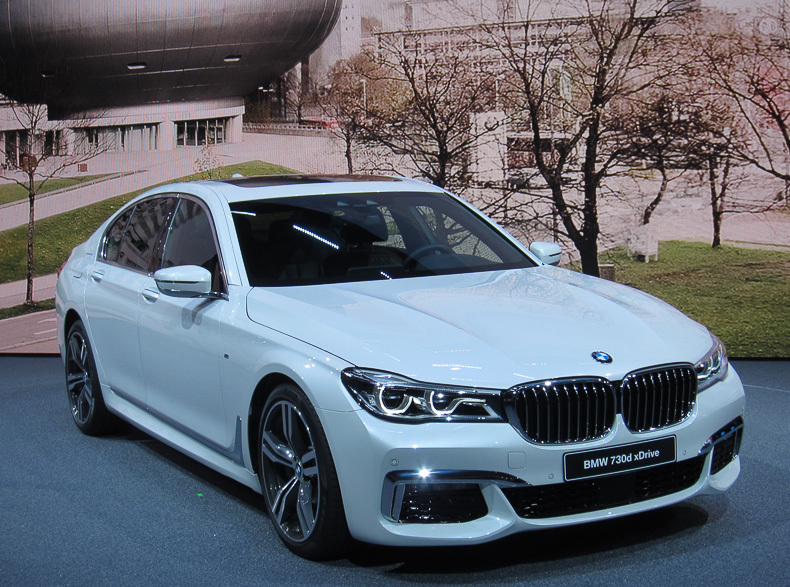 BMW has reduced the weight of the new 7 Series models by up to 130 kilograms compared to their predecessors, thanks to the body structure with Carbon Core and by the usage of carbon-fibre reinforced plastic (CFRP), which has been combined with steel and aluminium. 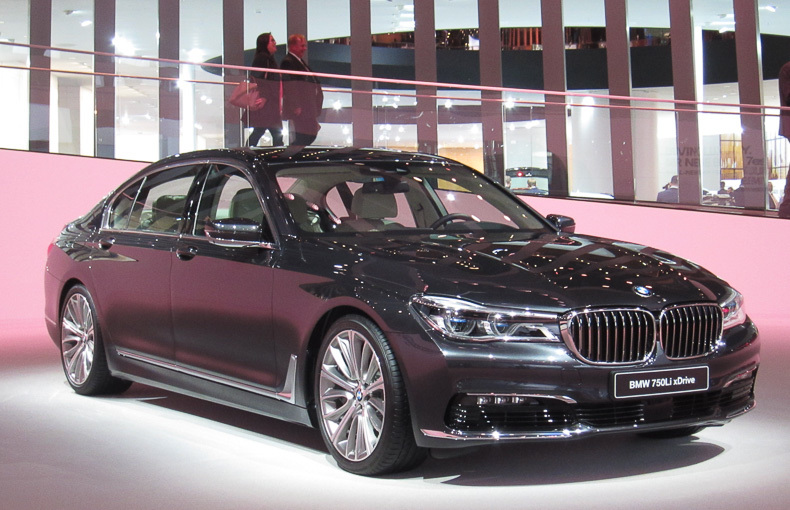 As of now, the new 7 Series comes with three petrol options and one diesel. The latter one is the 730d, which produces a peak output of 265 hp out of its 3.0-litre diesel mill and has an impressive average fuel consumption of just 4.6 l/100 km and CO2-emissions starting at 119 g/km. The 740i is powered by a 3.0-litre six-cylinder petrol engine, producing 326 hp, while the 750i has the new 450 hp eight-cylinder engine. Fuel consumption and CO2-emissions of the 740i have been reduced to 6.6 l/100 km and 154 g/km, as opposed to the 8.1 l/100 km and 189 g/km of the 750i. The 740e plug-in hybrid replaces the ActiveHybrid 7, which is powered by a 2.0-litre four-cylinder petrol engine combined with an electric motor, which together generate total system output of 326 hp. The 740e records fuel consumption of 2.1 l/100 km and CO2-emissions of 49 g/km. The 740e has an all-electric range of up to 40 kilometres and an emission-free top speed of 120 km/h. Key features include the Executive Drive Pro active chassis system, the Driving Experience Control switch with Adaptive mode, and BMW laserlight. Innovations when it comes to the operating system and driver assistance technology include iDrive system with a touch display, a Remote Control Parking system, Head-Up Display, Crossing traffic warning, Steering and lane control assistant, active side collision protection and Surround View system with 3D View and Panorama View. 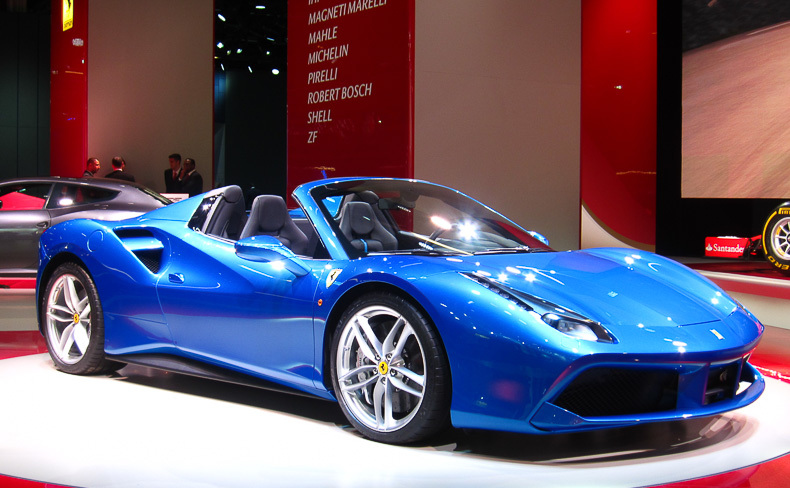 Ferrari launched the 488 GTB as the successor of the 458 Italia at the Geneva Motor Show during spring this year. At the IAA Frankfurt the 488 was introduced to press and public. Beneath the engine cover it features the 3.9 V8 turbocharged V8 engine with a maximum power output and torque of 670 hp and 700 Nm respectively. Said mill should launch the Ferrari 488 Spider from 0 to 100 km/h in 3.0 seconds flat and from 0 to 200 km/h in 8.7 seconds. The Retractable Hard Top comes as standard, which ensures a 25 kg lower weight compared to a fabric soft-top. It folds backwards in two overlapping sections and it takes 14 seconds for the top to fully retract or deploy. According to Ferrari, the SSC2 Slide Slip Angel Control System results in 12% faster acceleration out of corners than the 458 Spider and response times are 9% more rapid than in its predecessor. After eight years a car model would normally have been replaced by a new generation, Fiat decided otherwise and gave the highly successful 500 just a facelift. The new Fiat 500, which was launched on July 2007 and has since sold 1.5 million units, features new headlamps with LED daytime running lights and new rear light clusters with a ring-shaped structure, the interior has been revamped and has better materials throughout and the colour palette has been revised as well. The range starts with the 1.2 Fire petrol engine, producing 69 hp. The new Eco version has CO2-emissions of 99 g/km. The 0.9 TwinAir two-cylinder turbo petrol engine comes in two power outputs: 85 hp and 105 hp. The former one has CO2-emissions of 90 g/km; the latter one comes to 99 g/km of CO2. The 1.3 MultiJet 95 hp diesel engine has seen a reduction of CO2-emissions to 89 g/km. 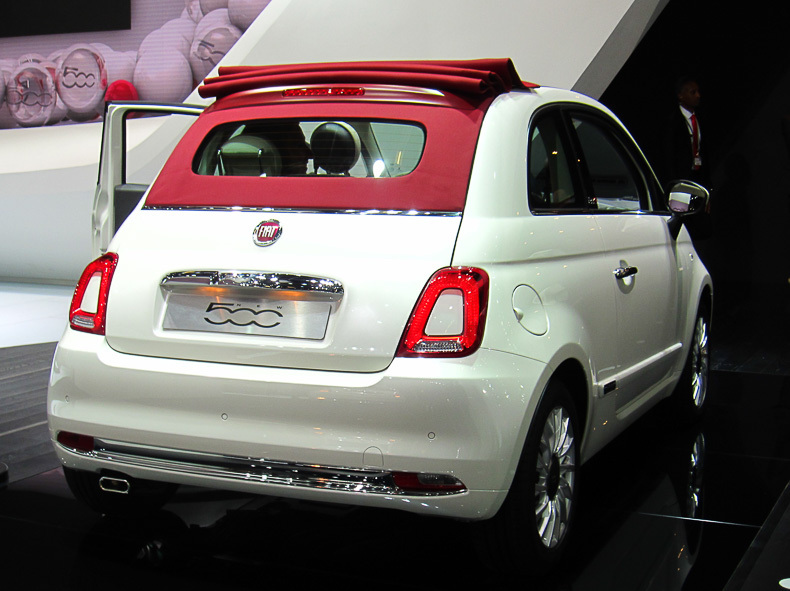 Fiat has already started selling the revamped 500. 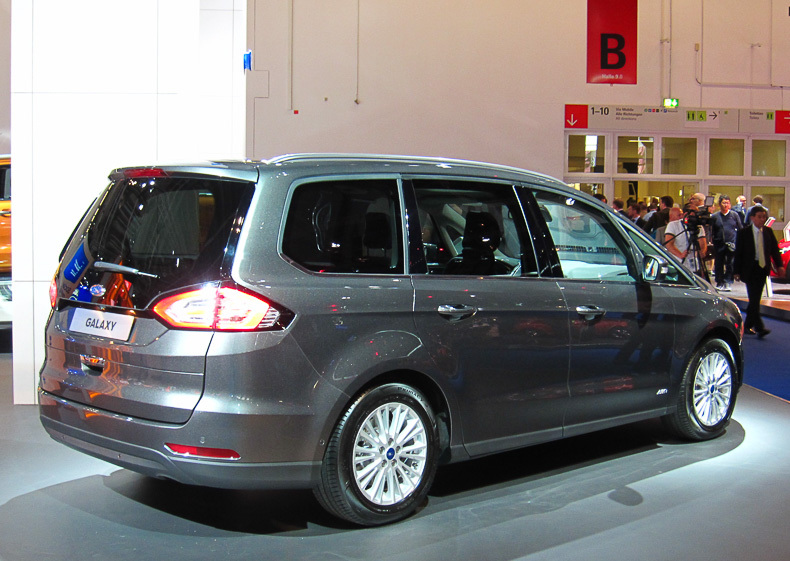 Ford revealed the third generation of its Galaxy full-size people mover. Its sole competitors are the Volkswagen Sharan and Seat Alhambra twins, as well as the van-based Mercedes-Benz V-Class. It follows the lines of its predecessor, with a large glass area, low beltline and horizontally positioned tail lamps. The new Galaxy sits on the same 2,850 mm wheelbase as its predecessor, but its length of 4,844 mm (+25 mm) and width of 1,916 mm (+ 32 mm) have been increased, while its height of 1,747 mm has been reduced by 17 mm. The dashboard is similar to its sibling Ford S-MAX, which focuses less on versatility and more on design and an engaging drive, and the Edge large crossover. It offers seven seats, which should provide more space to its passengers. At the push of a button in the rear compartment all second- and third-row seats will be folded flat, while the control panel can also be used to automatically raise the third row. 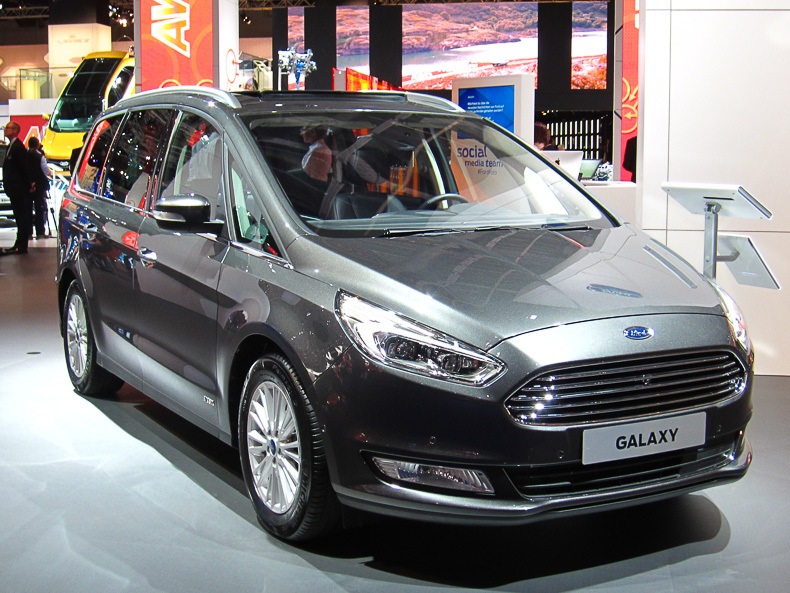 The new Ford Galaxy comes with new features like an Intelligent Speed Limiter and Pre-Collision Assist with Pedestrian Detection, Blind Spot Information System, Traffic Sign Recognition, Lane Keeping Alert, Lane Keeping Aid and Driver Alert, while it also features Ford’s SYNC 2 connectivity system. The engine range consists of a 2,0-litre TDCi diesel engine with a wide range of power outputs: 120 hp, 150 hp, 180 hp or 210 hp, the latter one with 450 Nm of torque. Petrol engine options include the 1.5 EcoBoost (160 hp) and 2.0 EcoBoost (240 hp). The Q30 is Infiniti’s global entry in the compact segment, which will soon be followed by the QX30 crossover. Both models will be built at Nissan’s site in Sunderland, United Kingdom. 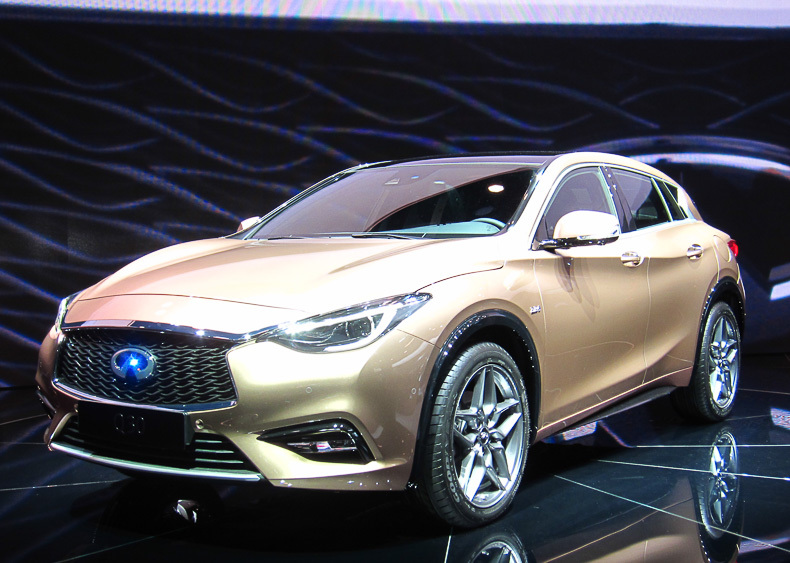 The Infiniti Q30 and QX30 are both based on the MFA platform, which sits underneath the Mercedes-Benz A-Class, B-Class, CLA and GLA. Apart from the A-Class, competitors include the Audi A3, BMW 1 Series, Lexus CT and Volvo V40. Its design is almost identical to the 2013 Q30 Concept, with rather dramatic curves and lines and the signature C-pillar and its asymmetric interior. The list of (safety) features includes Automatic park assistance with Around View Monitor and Moving Object Detection, Blind Spot Warning, Forward Collision Warning with Forward Emergency Braking, Auto High Beam Assist and an Intelligent Cruise Control. The Q30’s wheelbase is 2,700 mm, with the full vehicle length being 4,425 mm and overall height is 1,495 mm for base and Premium; 1,475 mm for Sport. Its cabin provides moderate space for rear passengers and 368 litres boot space. A varied range of powertrains will be available from start, all of which except for the 1,5-litre diesel are from Mercedes-Benz. The 1.5d (from Renault-Nissan) has a power output of 109 hp and combined fuel economy and corresponding CO2-emissions of 3.9 l/100 km and 103 g/km respectively. The 1.6t petrol comes both in 122 hp and 156 hp power outputs, with fuel economy and CO2-emissions of 5.8 l/100 km and 134 g/km, while the 2.2d (170 hp) diesel engine consumes 5.1 l/100 km and emits 133 g/km of CO2. Currently the 2.0t (211 hp) is the fastest of the range. Powertrains are mated to either a 6-speed manual gearbox or a 7-speed dual-clutch automatic transmission. 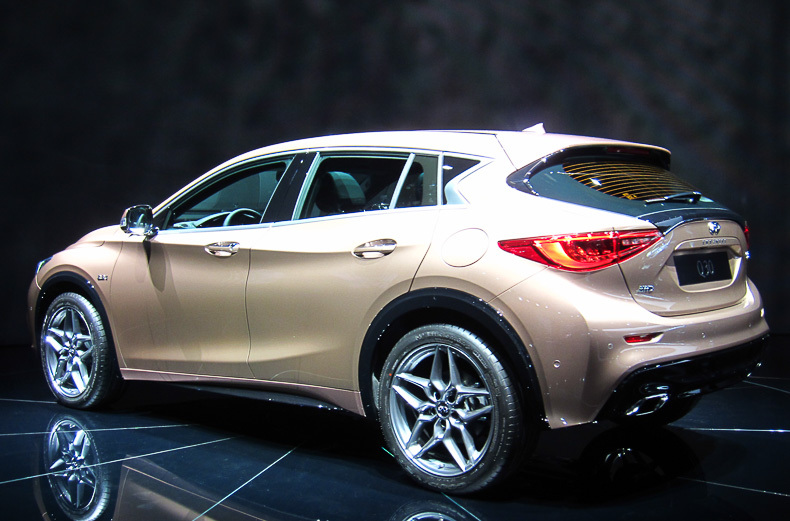 The Infiniti Q30 will go on sale later in 2015. Kia unveiled the complete refreshed cee’d range at the IAA Frankfurt after the launch of the cee’d GT Line in Geneva in spring. Kia subtly updated the look of the cee’d and pro_cee’d, with a new set of bumpers, LED taillights and new alloy wheel designs, while the materials in the cabin have been improved as well and sound-absorbing materials have been added to the diesel versions. The 1.0 T-GDI turbo petrol engine, which debuted in South Korea in the Morning (Picanto) months before, is the first of a range of new downsize engines that will be launched by Kia and Hyundai. It comes in 100 hp and 120 hp variants with CO2-emissions of 109 g/km and 115 g/km respectively. The naturally aspired 1.4 MPI (100 hp), 1.6 GDI (136 hp) and high-performance GT powered by the 1.6 T-GDI (204 hp) continue to be offered, as well as the 1.4 CRDi (90 hp) diesel engine. Kia has upgraded the 1.6 CRDi diesel engine (110 and 136 hp variants), which resulted in lowered CO2-emissions starting at 94 g/km. The power output of the high-power variant has been increased from 128 to 136 hp. Another novelty for the Kia cee’d is the launch of the seven-speed double-clutch transmission (DCT), which is exclusively available on the 1.6 CRDi 136 hp. Compared to the earlier 1.6 CRDi with six-speed automatic transmission, CO2-emissions have dropped from 145 to 109 g/km. Kia added some safety features, however the principal enhancement of the cee’d is, according to Kia, the addition of a new torque vectoring system, which reduces understeer, while the electric power steering system has resulted in improved on-centre steering feel. More enhancements to the suspension should have improved the ride comfort on poor surfaces. Sales of the revamped Kia cee’d have already started. 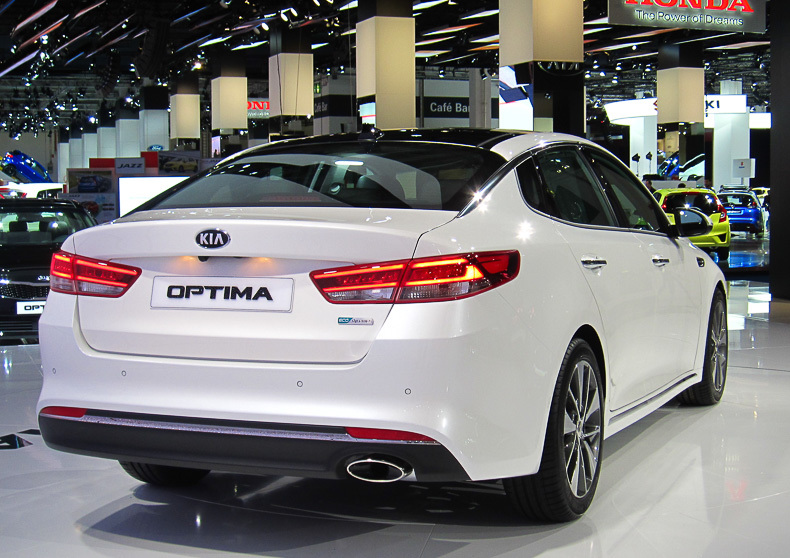 The fourth-generation of the Kia Optima (the first two generations were sold as Magentis in Europe) had its European debut at the IAA Frankfurt, while the Optima GT had its global premiere. The all-new Optima has an evolutionary look, while exterior dimensions have increased: the wheelbase has been extended by 10 mm to 2,805 mm, with the full vehicle length growing 10 mm to 4,855 mm. Meanwhile the new model is 25 mm wider, at 1,860 mm, and 10 mm taller (1,465 mm), which resulted in improved cabin and cargo space, with for example 25 mm more legroom than before and 510 litres instead of 505 litres cargo space. Drag of the Optima has been reduced from 0.30 to 0.29 Cd. Kia promises an improved ride, more agile handling and greater overall refinement and offers the model with various safety-enhancing features, including an Advanced Smart Cruise Control, Autonomous Emergency Braking, Lane Keeping Assist System, High Beam Assist, Speed Limit Information Function, Blind Spot Detection and Rear Cross Traffic Alert. Optionally available is an electronic controlled suspension system. The long-overdue 2.0 petrol engine with 163 hp has been carried over from the outgoing Optima, with CO2-emissions of 175 g/km compared to just 115 g/km for the Volkswagen Passat 1.4 TSI ACT (150 hp). The 1.7 CRDi diesel engine is more competitive and now produces 141 hp instead of 136 hp and 340 Nm of torque (+ 15 Nm), while CO2-emissions have been reduced by 10% to 110 g/km. Another novelty is the availability of the seven-speed DCT gearbox, which has seen CO2-emissions drop to 116 g/km (- 40 g/km) compared to the outgoing model fitted with six-speed automatic transmission. Sales will start in Q4 2015, with the Optima GT due for launch in 2016, which is powered by a 2.0 T-GDI 245 hp petrol engine, with maximum torque of 353 Nm and CO2-emissions of 191 g/km. 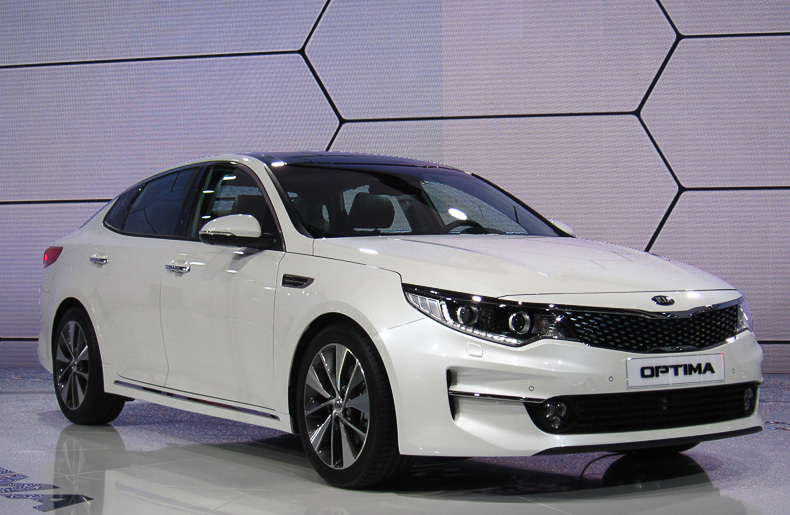 In a later stadium Kia will launch the Optima stationcar based on the Sportspace Concept and a plug-in hybrid drivetrain. These additions are well needed if Kia wants to make an impact, which its predecessors simply couldn’t on the European market. 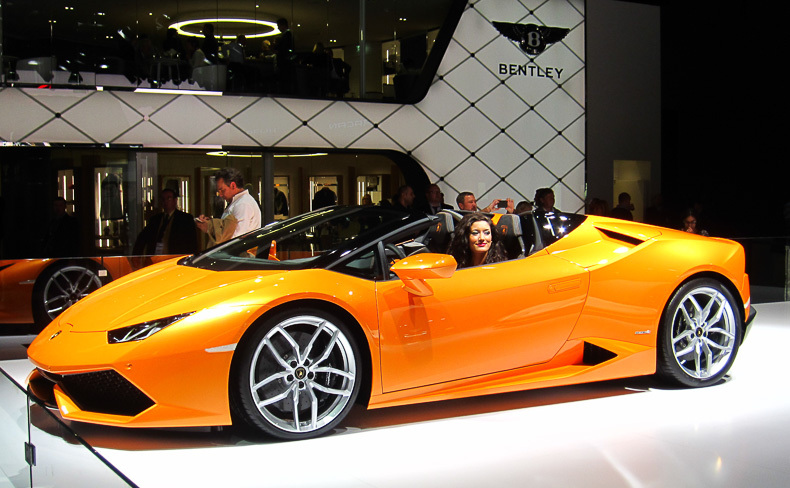 Lamborghini presented the spyder version of its Huracán, joining its direct rival Ferrari 488 Spider. Its new electro hydraulic, lightweight soft top opens in 17 seconds up to a driving speed of 50 km/h. The Lamborghini Huracán LP 610-4 Spyder is powered by the naturally aspired 5.2-litre V10 engine, producing 610 hp and 560 Nm of torque. The drivetrain is mated to a seven-speed dual-clutch gearbox. Its top speed is 324 km/h, it accelerates from 0 to 100 km/h in 3.4 seconds and from 0 to 200 km/h in 10.2 seconds. Under those circumstances it probably won’t reach its average fuel consumption of 12.3 litres per 100 km, a reduction of 14% compared to its predecessor, the Gallardo Spyder. It boasts a dry weight of 1,542 kilograms, while its torsional stiffness should have been improved by 40%. With the unveiling of the refreshed Ypsilon, Lancia showed that it is still very much alive. 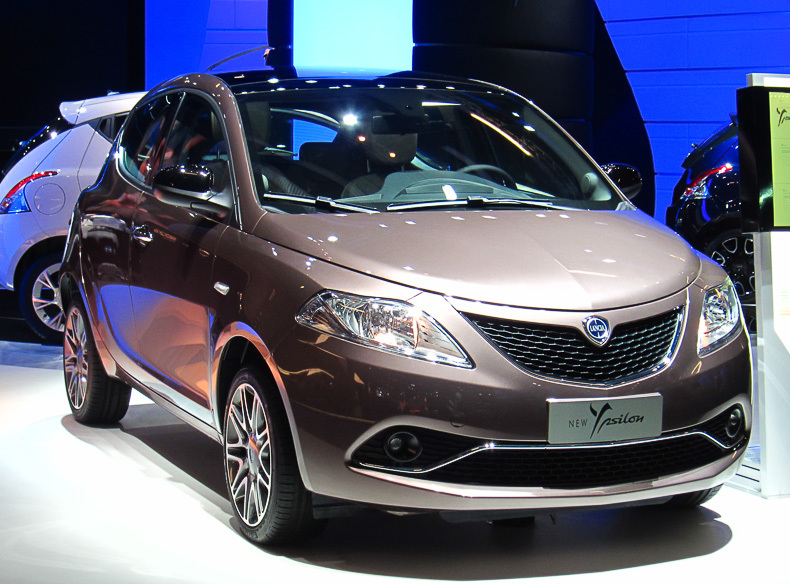 Lancia will continue to sell the Ypsilon in mainland Europe for some two years and afterwards be sold in Italy only. Since the introduction of the Ypsilon in 1985, the brand managed to sell over 2.7 million units across Europe. The range starts with the good old 1,2-litre Fire four-cylinder petrol engine developing 69 hp, which can also be had as bi-fuel Ecochic LPG/petrol with CO2-emissions of 110 g/km. The more powerful 0.9 two-cylinder TwinAir Turbo, which develops 85 hp, is combined with a semi-automatic transmission. The 0.9 TwinAir Turbo Ecochic bi-fuel methane/petrol (80 hp) has the lowest emission with 86 g/km of CO2. The 1.3 MultiJet four-cylinder diesel completes the range and has a power output of 95 hp and CO2-emissions of 95 g/km. Sales of the refreshed Lancia Ypsilon, which features a new front bumper, grill and a renewed colour palette have already started. 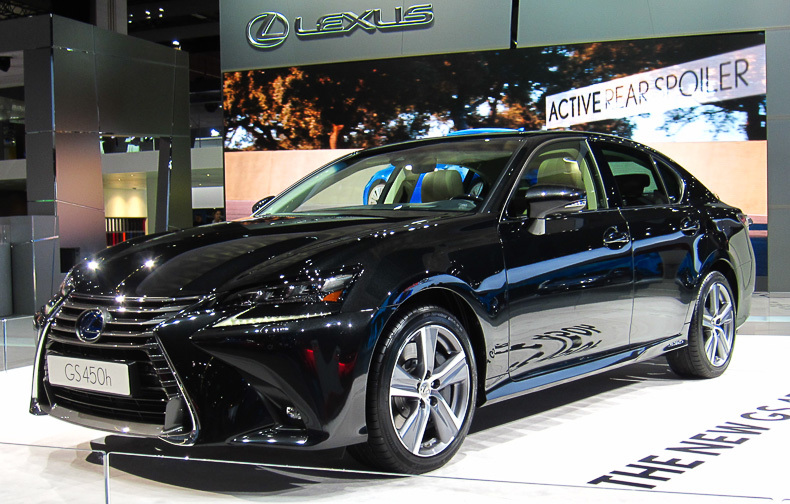 Lexus launched the refreshed GS, with new bumpers, Bi-LED headlights and revised taillights. Furthermore, Lexus launched the new GS 200t with a 2,0-litre turbo petrol engine, which produces 245 hp of power and 350 Nm torque, teamed with an eight-speed automatic transmission. The GS 200t is available in selected European countries. The GS 350, available in selected East European countries only, is powered by a 3,5-litre V6 petrol engine (317 hp/380 Nm). Available in all European markets are the hybrids: the GS 300h featuring a 2,5-litre four-cylinder petrol engine combined with an electric battery motor, which should achieve an average fuel consumption of 4.7 l/100 km and CO2-emissions of 109 g/km. 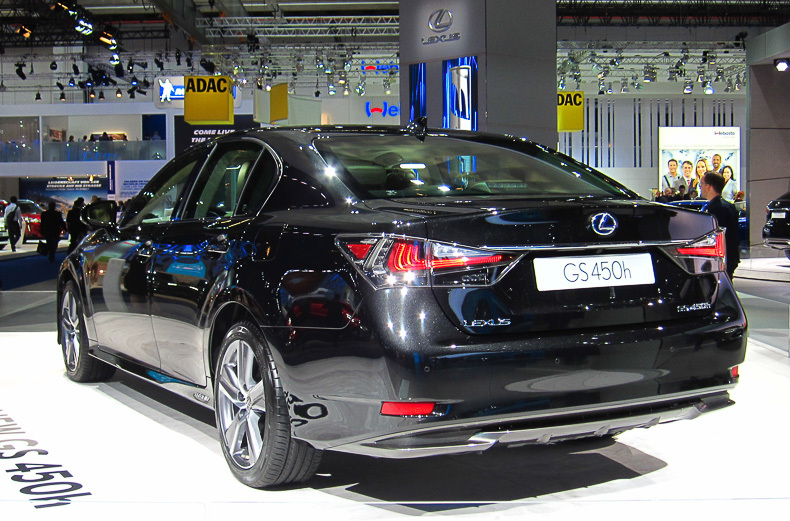 The GS 450h, which is powered by a 3.5 V6 petrol engine combined with an electric motor, is the most powerful version with a total system output of 345 hp and average fuel consumption of 5.9 l/100 km. The GS F power sedan with its 5,0-litre V8 engine is the range-topper. The new Lexus GS comes with updated multimedia technology and the latest Lexus Safety System+, which combines Pre-Crash System with Pedestrian Detection, Lane Keep Assist, Adaptive High-beam System and All-Speed Active Cruise Control.